Christmas season is in the air and everyone is already planning for their holiday shopping to buy gifts. Tutuban Center in Tondo Manila offers a great deal for affordability that can give you a lot of savings. As early as November, the shopping and entertainment destination right in the heart of the City of Manila is offering the widest variety, quality holiday items and yet affordable. Just walk through the hundreds of stores inside and around Tutuban Center with wide array of merchandise and you can surely find what you need in one of the country's most visited shopping center. Whether buying by piece or in bulk, there’s no need to worry because this much-admired retail destination is your perfect Christmas shopping solution. If you are planning to design your home with festive decors, check out the wonderful Yuletide garlands, colorful lights and all types of Christmas tree trimmings available at Tutuban Center. From the simplest Christmas balls to the biggest parol, you are sure to find the best holiday ornaments that you need. Christmas gift shopping for family, friends and colleagues is fun and easy with Tutuban Center’s complete offerings - from jewelry, designer shirts, fashion finds, fragrances, shoes, novelty items, even electronic gadgets such as mobile phones, laptops, cameras or tablets. Apart from the budget-friendly items, you’ll be amazed with the festive holiday mood as Tutuban Center unveiled its holiday display to help keep your mind off the stressful Christmas rush and for the enjoyment of the shoppers. There’s also the “Christmas Wonderland sa Tutuban” where the young, or even the young at heart, can go to and enjoy with its amazing rides and other well-loved attractions. If you suddenly grow hungry, explore delicious food fare at the Tutuban Center Food Bazaar. 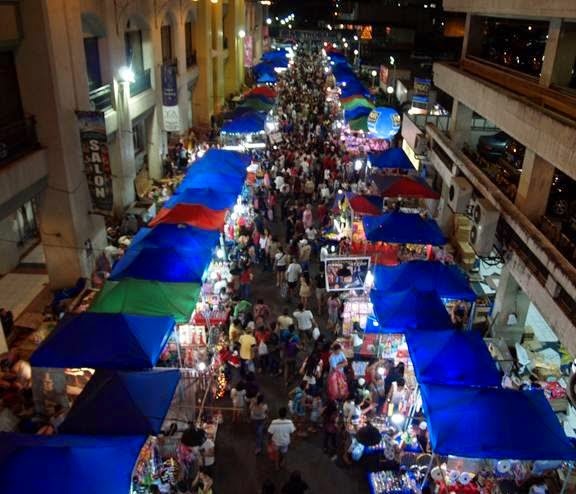 Meantime, for those who want to avoid the shopping frenzy at daytime, the Tutuban Center Night Market offers a comfortable shopping experience even after the regular shopping hours. Lastly, if you want to take first crack at shopping and avoid the mad rush both in time and traffic, you may check-in at Orion Hotel, Tutuban Center’s swanky yet right-in-your-budget accommodations located right inside the center. This allows you to shop fresh and fabulous in the morning. All of these and more in Tutuban Center, located along C.M. Recto Avenue in Manila. Operating hours are from 9 am to 12 midnight, from Monday to Sunday.